We'll be building up a list of places of interest local to The Dukeries Lodge that registered users can rate. This will help visitors to the area find the best places to go and might even provide some inspiration for us locals too. If you want more information on any of these, why not pop in and see us - we might have some further literature, advice or even discount tickets for some of them. Inside the Forestry Commission's Sherwood Pines Forest is a Go Ape High Wire adventure. The aerial assault course through Robin Hood Country is a network of rope bridges, Tarzan swings, platforms, netting and 'death slides' that stretch through the tree canopy. There are a number of courses to choose from,or why not go off exploring the forest on the latest in green technology – a self-balancing electric segway. It’s a totally unique way to tackle the trails in the forest. 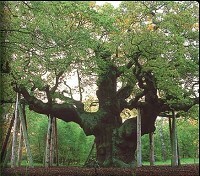 The Major Oak is a large English oak tree in the heart of Sherwood Forest, around 15minutes from Edwinstowe. According to local folklore, it was Robin Hood's shelter where he and his merry men slept. It weighs an estimated 23 tons, has a girth of 33 feet and its branches spread to over 92 feet. Sherwood Forest Art and Craft Centre lies in the heart of ancient Sherwood Forest in the beautifully converted coach house and stables of the former Edwinstowe Hall. The centre houses a variety of artists and crafts people. Nottinghamshire's biggest craft centre includes paintings and prints, textiles, blown glass, fossils and gemstones, card-making supplies, coppersmith, wildlife photography, candles, woodturning, ceramics and jewellery. There are over 25 acres with more than 3,000 animals including cows, pigs, sheep and hens but there are also some more unusual animals such as llamas, chinchillas, bats, reptiles and spiders. The outdoor play area includes 2 forts, large trampolines and our go-kart track with pedal go-karts whilst indoors has a 60ft long sledge run. Just a 5 minute drive from Edwinstowe.